Uppsala University researchers have devised a new model for the Universe -- one that may solve the enigma of dark energy. Their new article, published in Physical Review Letters, proposes a new structural concept, including dark energy, for a universe that rides on an expanding bubble in an additional dimension. We have known for the past 20 years that the Universe is expanding at an ever accelerating rate. The explanation is the "dark energy" that permeates it throughout, pushing it to expand. Understanding the nature of this dark energy is one of the paramount enigmas of fundamental physics. It has long been hoped that string theory will provide the answer. According to string theory, all matter consists of tiny, vibrating "stringlike" entities. The theory also requires there to be more spatial dimensions than the three that are already part of everyday knowledge. 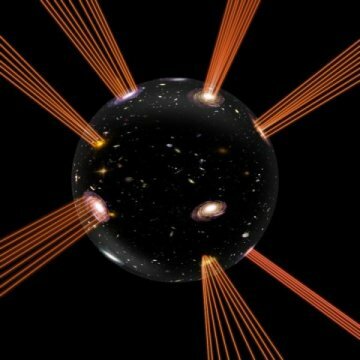 For 15 years, there have been models in string theory that have been thought to give rise to dark energy. However, these have come in for increasingly harsh criticism, and several researchers are now asserting that none of the models proposed to date are workable.